The name Aikido is composed of three Japanese words: Ai, meaning harmony, Ki, spirit or energy, and Do, path, system, or way. 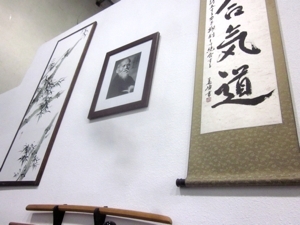 Aikido is the way of the spirit of harmony. Martial arts are studied for self-defense and self improvement but in Aikido the practitioner seeks to achieve self-defense without injury to attackers. The basic movements of Aikido are circular in nature; most attacks are linear. The Aikidoist harmonizes with, rather than confronts, an aggressive line and converts it into a circular motion that renders attackers helpless. Instead of using potentially crippling kicks or punches, the Aikidoist trains to apply various wrist locks, arm pins, or unbalancing throws to neutralize aggressors without serious injury.